This form needs to be completed prior to the first training session. All details will be kept confidential. These details will be used for the evaluation of the patient’s health and readiness to start their exercise program. 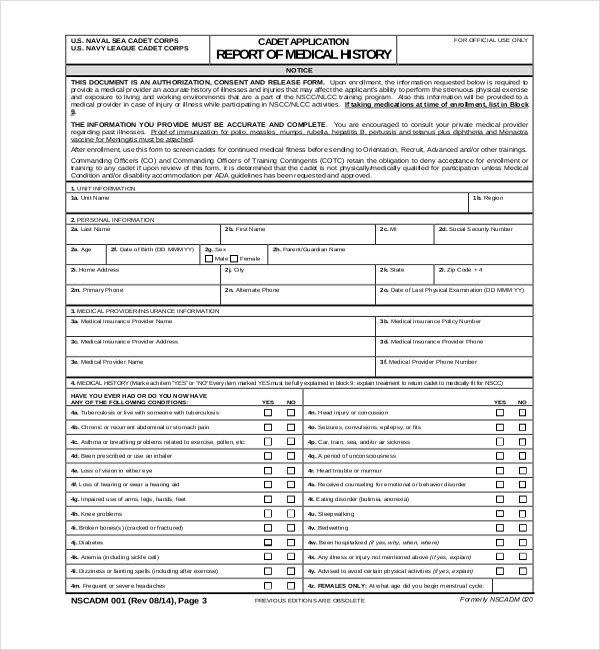 This form is extensive, but it should be as accurate and complete as possible. 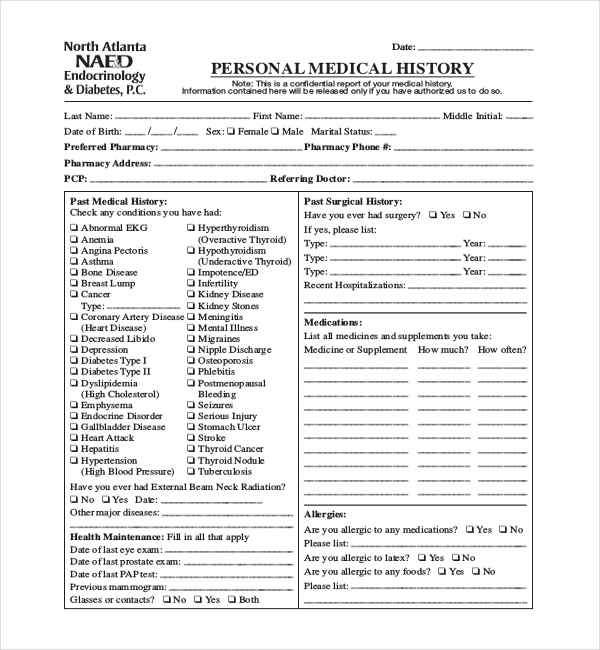 This form does not replace the medical history form; however, one can use it to get started on the family medical history. 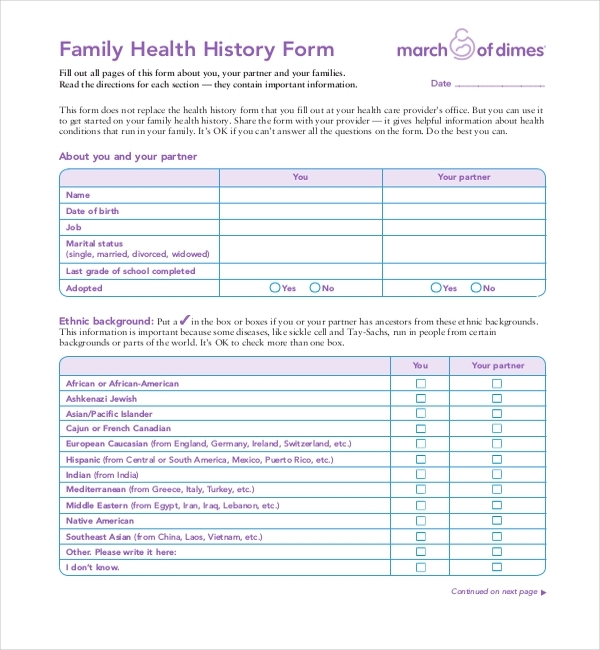 The person should share this form with the provider — it gives helpful details about medical conditions that run in their family. All questions are not mandatory in this form. All the information about the person received and maintained in this form is protected in confidential manner. The answers are for the records only and will remain confidential as subject to applicable laws. One will be asked some questions about their responses and there may be added questions about health. In this form, the primary collection of the details is from people looking to join the Armed Forces. 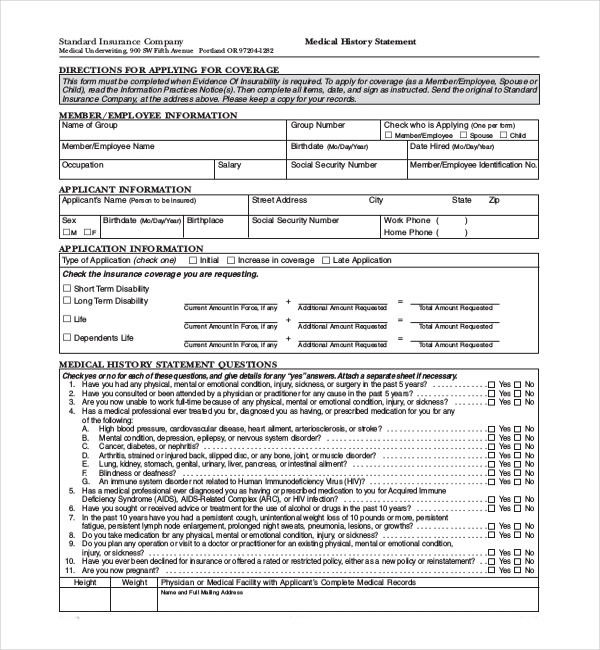 The details collected on this form are used to help physicians in making determinations for military service as to acceptability of applicants. 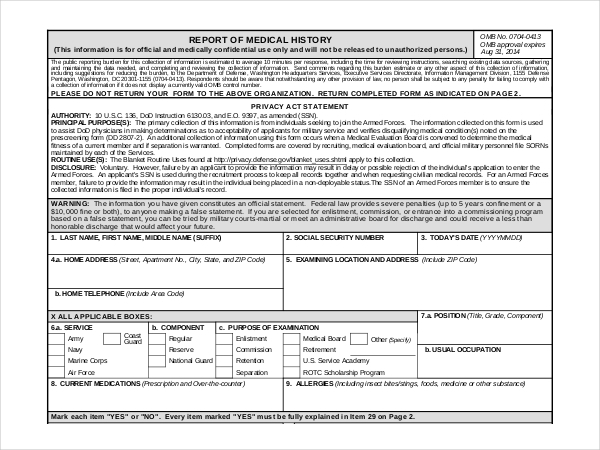 They will verify disqualifying medical conditions noted on this screening form. 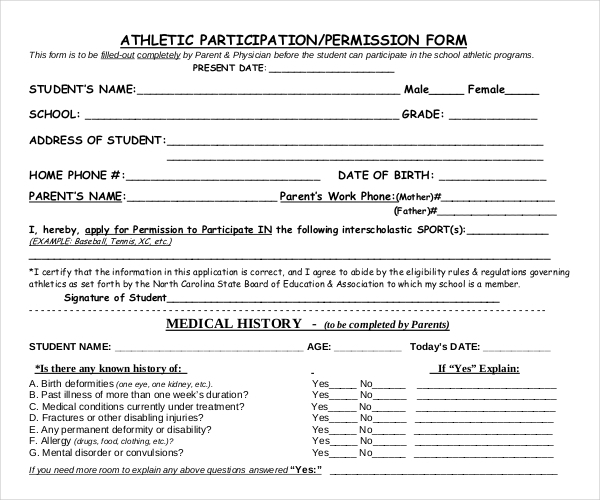 This form is to be completely filled out by the applicant’s parent or guardian with the physician, if the student is less than 18 years, before he/she can participate in the sports. If the applicant is an adult during the school year, he/she must also sign the athletic participation waiver. In this form, additional information occurs when a Medical Evaluation Board has to determine the medical fitness of the person. 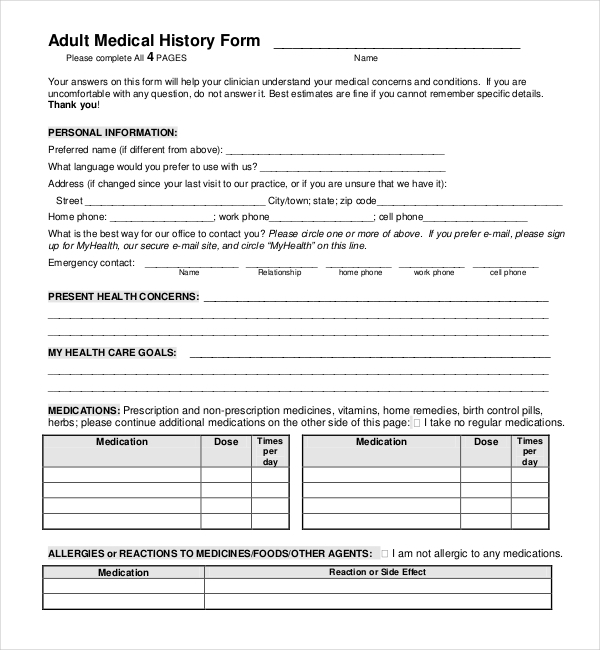 Completed information are required in this form are by medical evaluation board, recruiting, and official military personnel file SORNs controlled by each Services. This information is vital to provide appropriate care. In this form, all the information about the child and parents are required including surgical history. Any medical conditions the child has been treated for in the past must be listed, such as jaundice, allergies, chicken pox, heart problems, eczema, asthma, strep throat, bone or joint problems (bracing/casting), recurring ear infections, etc. 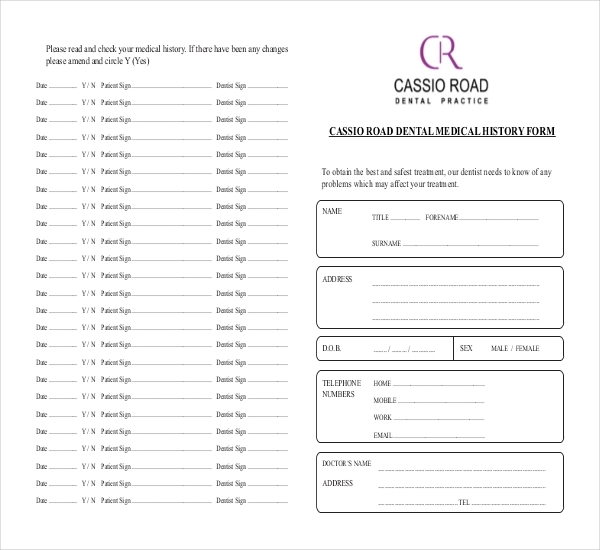 This form is required to provide a person with the most suitable laser treatment. Thus, the person has to complete the questionnaire which will require certain information. The information must be true and correct to inform the technician, therapist, doctor or nurse of their current medical conditions to perform appropriate treatment procedures. In this form, dentists need all the information about their patient’s general health to treat them safely. The dentist will ask when them to visit so that one can tell them whether there has been any big change in their general health. The dentist will treat all information as strictly confidential. 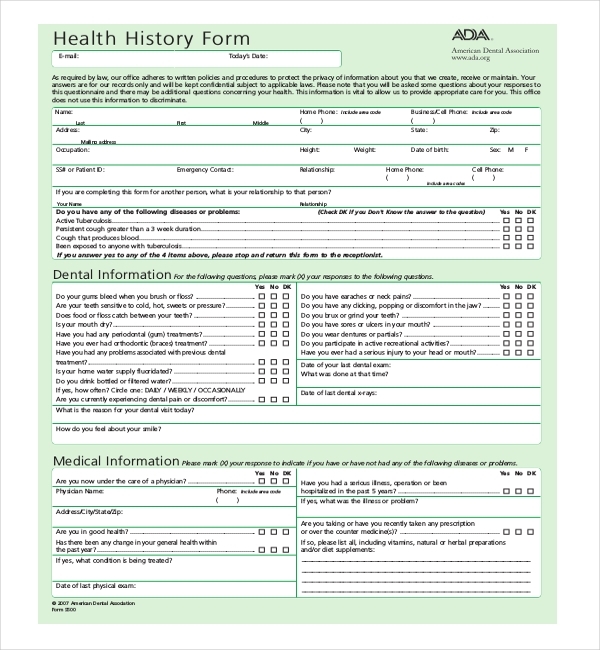 In this form, the patient is required to mention everything about their health. Several diseases have effects on the mouth and teeth, and oral health is related to overall health. 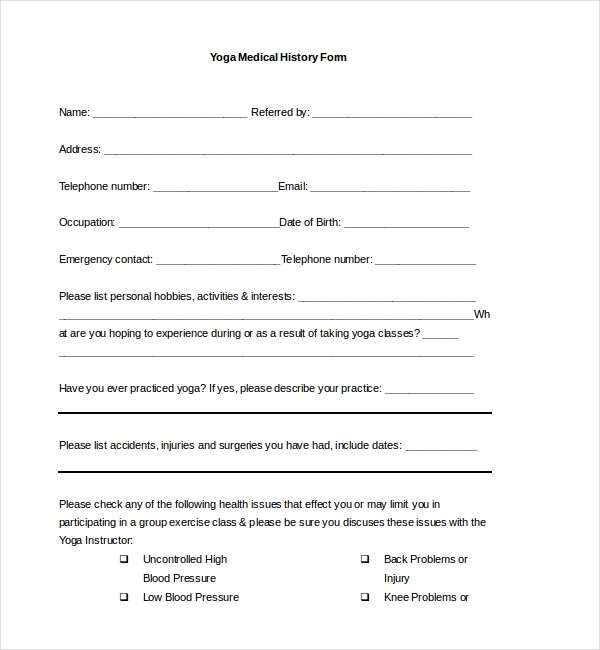 They need to write their contact details in this form answer the health questions and then sign on the back page. 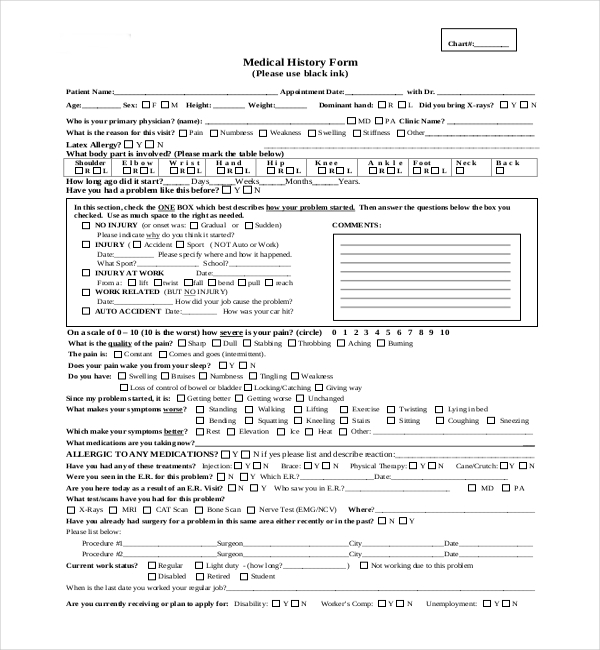 This form is required to be filled by the employee whose duties for the job position is based on medical examination vital to determine medical clearance. Such analysis is consistent with business requirement and needs that determination be made that one do not pose a risk to patients, co-workers or others people in the workplace. 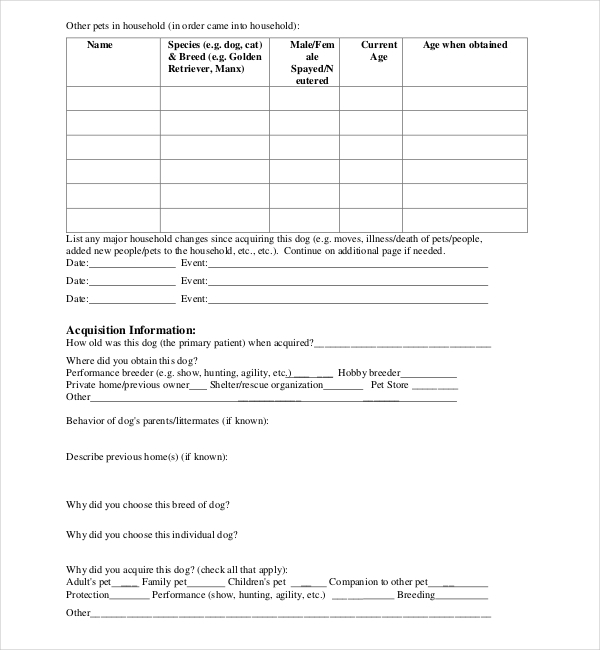 In this form, the parents are required to fill complete and accurate information about their daughter and her participation in the prescribed activities. They also need to make sure that they will inform in writing about any changes during the Girl Scout year. They need to understand that all the details will remain confidential. 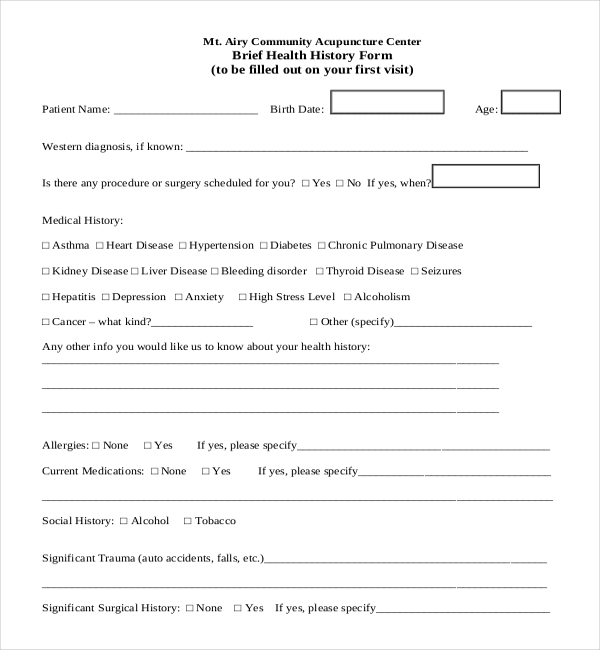 This form will help the person prepare for upcoming visit with their doctor. Some parts of the form can unclear, they should take their time to complete and review it carefully and thoroughly to be certain one has not left anything out. Their answers will help design a comprehensive program that meets their needs. 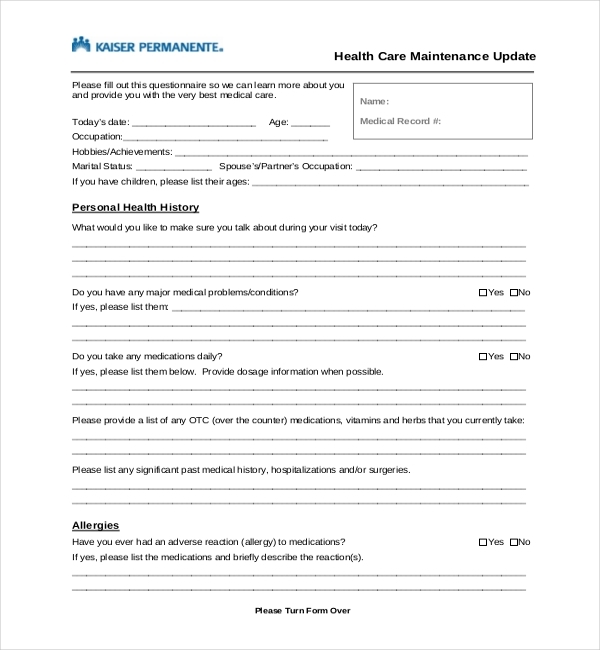 Upon enrollment, the information requested in this form is required to give a medical provider a correct history of illnesses and injuries that may affect a person’s ability to execute the strenuous physical exercise that are a part of the NSCC/NLCC training program and exposure to living and working environments. The person must try their best to complete this form. 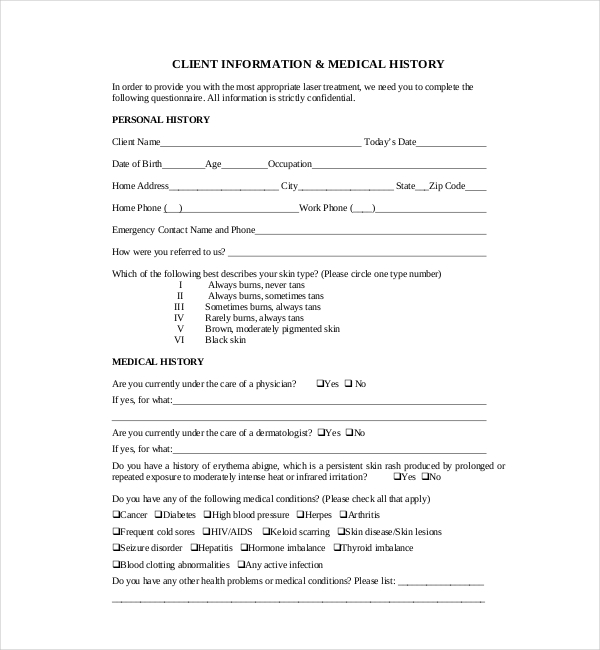 One’s questions will be thoroughly addressed afterwards as it will be helpful for them to keep a written list of questions or concerns as they complete this medical history form. The provided information will be treated as strictly confidential by the medical care provider. 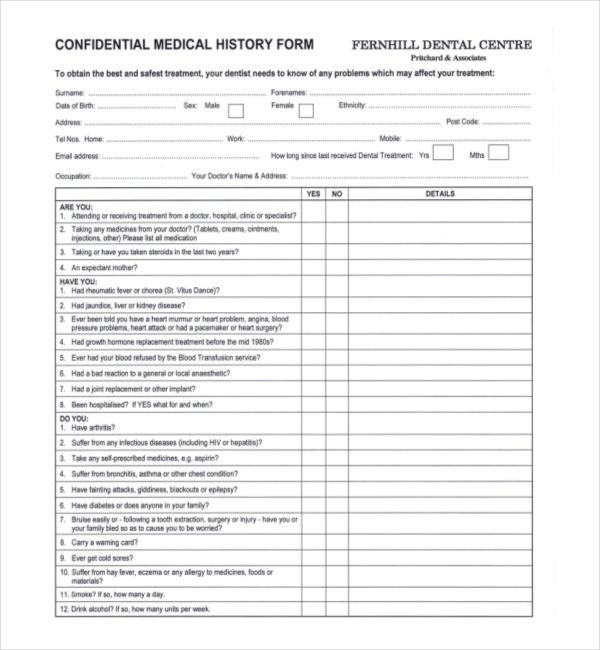 In this form, a person’s answers will help the medical care provider to understand their medical history and the concerns they did like to discuss with their doctor. They must try to fill all answers as much as possible; however, if they can’t then they can leave some as every question is not mandatory. In this form the person is required to inform about their relation with the child, present health conditions, details about the child, including whether the child had unusual feeding. The person also needs to inform the hours of sleep the child regularly have and at what age did he/she sat alone. With the use of standardized medical history form, this process has been made much more efficient as it can be completed by the patient before their visit. 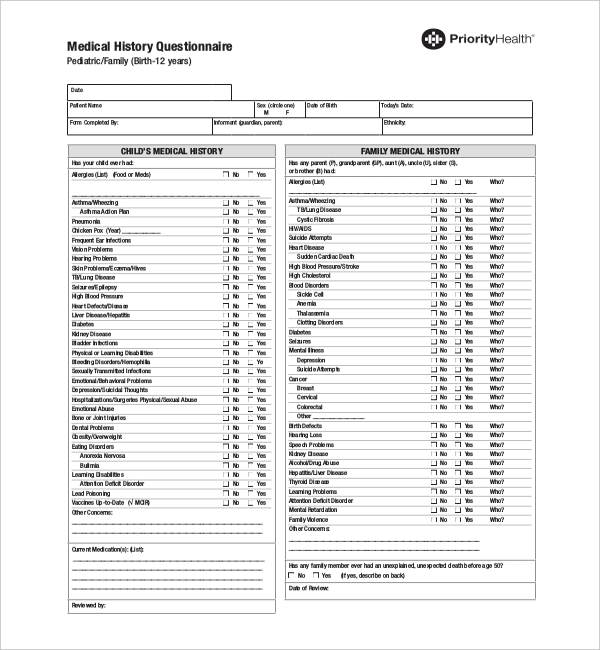 The preoperative evaluation can be facilitated by standard medical history form, although every patient’s history is unique and should be discussed in detail. The information requested on this form is essential to fully understand what is affecting the pet and the patient. One must have enough time to think on the answers before entering the examination room. Amid the appointment, there will be lots of time to go over these questions in more detail. In this form, the person is required to fill their personal hobbies, activities & interests. They are also required to inform what they are hoping to experience during or after taking yoga classes. They should provide information on whether they have ever practiced yoga earlier and if they did how was the experience. If they had surgery or a major illness, they should include this information in this form. While taking few moments to fill this form, the most important part to remember is accuracy of history. The person can be asked to provide additional information during consultation with a veterinarian. Hence, one should not worry if they left something or didn’t know an answer. They are also required to list any accidents, injuries and surgeries they had with dates. The purpose of checking the employee or student’s medical history is to know their strengths and find areas of needed rest. The physician has to explain whether the person’s health is well for the work he/she will like to do. 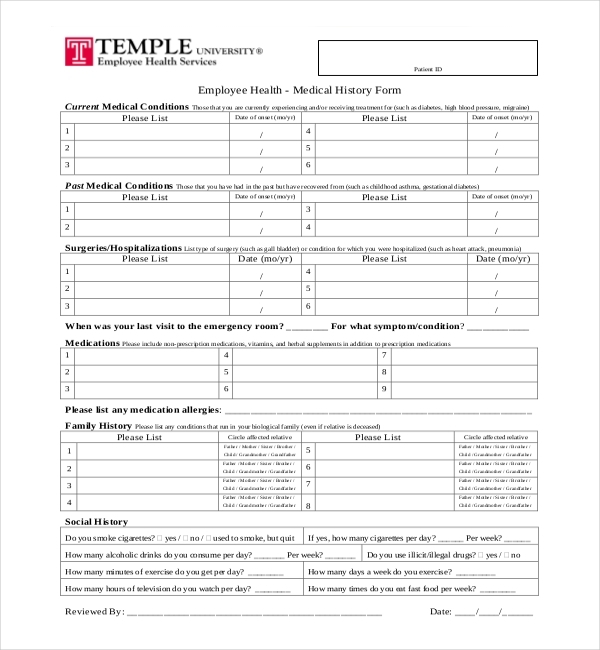 The medical history form helps employers to gain knowledge of the health of their team member in the work place. These details of history are used to assist people in join the field which is both good for them and their health. In this process, employees might gain more preferred job according to their health condition.